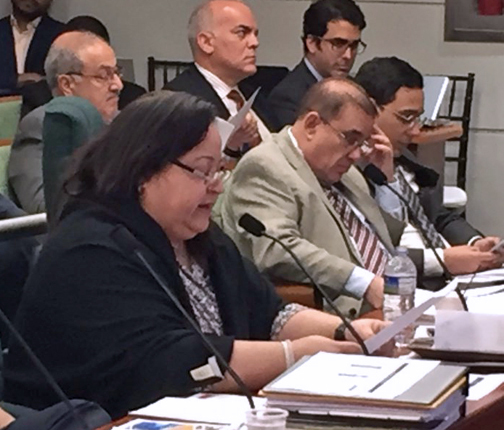 The Puerto Rico Government Development Bank is waiting for creditors to submit a “global” restructuring offer that would address some $48 billion in debt in its entirety, rather than piecemeal, agency President Melba Acosta said during budget hearings Monday. The government has been in negotiations with creditors since late last year, trading offers that have so far been rejected on both sides. Acosta said three groups of bondholders — General Obligations, Sales Tax Financing Corp. (COFINA) Senior creditors that hold $6 billion in debt and COFINA subordinated creditors, which hold another $8 billion — have submitted four proposals. After receiving the offers, the government has presented its third proposal, which has not been made public, but is being discussed with creditors. “Some of the bondholders with whom we’ve been negotiating, which began asking to be paid at par value, are already talking possible discounts,” she said. “We’ve also asked creditors to bring global offers, and not just related to their particular credits, which we’re now waiting for,” she said. The government is currently in talks with bondholders holding 11 different types of debt issued by the same number of public entities. Not included in the talks is debt held by the Puerto Rico Electric Power Authority, the Puerto Rico Aqueduct and Sewer Authority, the Public Buildings Authority, the Children’s Fund, the Municipal Finance Authority and the Convention Center District Authority. “It’s worthy to note that conversations with holders of GO and COFINA Senior debt have been particularly constructive,” she told lawmakers. However, during the hearing Acosta admitted that while some groups have been expressing concerns about continuing negotiations while Congress is discussing the possibility of establishing a federal oversight board for the island, and its implications on any agreements reached, other creditors have moved forward with restructuring talks. The government’s total debt, including public corporations, stood at around $68 billion in March, she said. Meanwhile, during his turn to testify, Treasury Secretary Juan Zaragoza confirmed the government’s audited financial statements should be released by the end of June. The document is still missing the GDB’s statement, which would round out the government’s 75 reporting units. Hey Buddy!, I found this information for you: "GDB waiting for ‘global’ restructuring offer for B debt". Here is the website link: https://newsismybusiness.com/waiting-global-restructuring/. Thank you.